Hot Rodders were hugely disappointed when it became known that the Hot Rod Rumble, an epic event held over the Easter 2005 weekend at Calder Park, was put on hold after insurmountable problems with the venue management. Many Hot Rodders have been in constant touch over the last few years hoping for a return of this extremely successful event, well… the time has finally come for this great event to be resurrected. 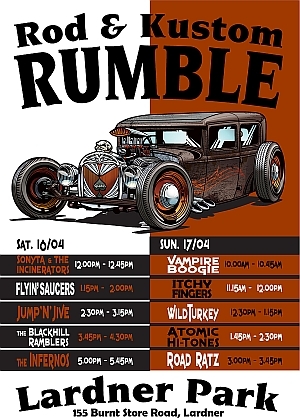 The 2011 Hot Rod Rumble will be held on the 16th-17th of April 2011, the weekend prior to Easter, at Lardner Park a great venue for such an event, and the format, although varied from the first Hot Rod Rumble, will still be exciting and entertaining. 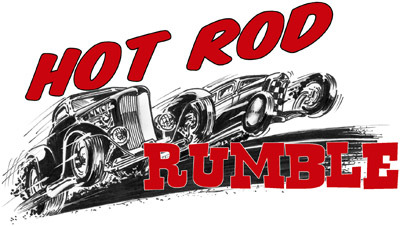 We have plans in place to ensure that the Hot Rod Rumble will continue to bring an exciting event to Hot Rod enthusiasts over Easter weekends in subsequent years. This event is modelled after the successful Kustoms Of Australia event strategy, but with its own unique flavour. Rockabilly festival, Hot Rods, Kustoms, Musclecars, the Hot Rod Rumble will be structured in such a way that its bound to bring enjoyment to all automotive and music enthusiasts for many years to come. This event is organised by Chopper and the Kustoms of Australia krew, so ya just know it’s gonna be fun. With so much going on your biggest concern would be to choose which part of the action you’ll be watching or participating in over the weekend.